MIAMI--(BUSINESS WIRE)-- For the 40th consecutive year, Ryder System, Inc. (NYS: R) , a leader in transportation and supply chain management solutions, recognized the tradition of driver excellence by presenting its annual "Driver of the Year" awards to three professionals who, combined, have 106 years and close to 10 million miles of safe, professional driving experience. "Our highest priority is the safety of employees, customers and the general public with whom we share the road," said Robert Sanchez, Ryder President and Chief Executive Officer. "Ryder's Driver of the Year winners are excellent ambassadors of Ryder's safety culture and have distinguished themselves as leaders in one of the most challenging and demanding occupations - professional truck driving." One of the Company's longest running and most prestigious recognition programs, the "Driver of the Year" award honors drivers who have demonstrated exemplary safety performance, customer service and citizenship throughout their careers. Honorees are selected after a rigorous review process by a committee that includes Ryder customers, executives, safety experts, and professional drivers. 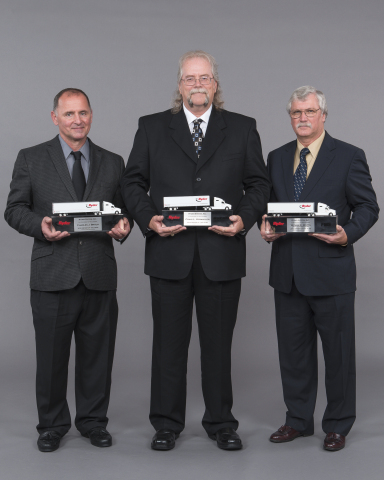 The top awards this year were presented to two drivers employed by Ryder's Supply Chain Solutions division and a driver employed by one of Ryder's Fleet Management Solutions customers. Recipients receive a five-day Caribbean cruise, cash award, specially designed ring and watch, and will be inducted into the Ryder "Driver Hall of Fame." Charles Braun is the Driver of the Year winner for Ryder's Supply Chain Solutions business. Drivers are an important part of Ryder's Supply Chain Solutions offering, ensuring that customers get their products to stores or raw materials to manufacturing plants, safely and on time, every time. Mr. Braun drives for one of Ryder's automotive accounts based in Orlando, Florida. He has driven 2.1 million preventable collision-free miles during his 22 years with Ryder and a total of 3.3 million preventable collision-free miles over the course of his impressive 34-year professional driving career. Craig Vorwaller is the Driver of the Year winner for the Ryder Dedicated service offering. Ryder Dedicated drivers are responsible for operating specialized equipment, unique product handling, running complex routes, and meeting rigorous service level agreements. The drivers have a special responsibility when they represent Ryder customers, as they often wear uniforms with Ryder customer logos and drive vehicles emblazoned with customer brands. Mr. Vorwaller drives for the Swire Coca-Cola account based out of Salt Lake City, Utah. He has been with Ryder 22 years, and during his tenure he has driven over 2 million miles without an injury. Wyman Watts is the Driver of the Year winner for Ryder's Fleet Management Solutions business. Mr. Watts works for Ryder lease customer Lindau Chemicals, Inc., out of Columbia, South Carolina and relies on Ryder to provide the well maintained, safe vehicles that he drives each and every day. He has been employed by Lindau Chemicals for seven years and has driven 3.8 million collision-free miles over his 38-year professional driving career. The three drivers were honored at a recent awards ceremony held at Ryder's headquarters in Miami. Ryder Executive Chairman Greg Swienton, accompanied by key Ryder executives and the drivers' local managers, personally congratulated the honorees. Greg Swienton commented, "The Driver of the Year award exemplifies Ryder's heritage of safety, not only for the 40 years of the program, but during the company's 80 years in business. Our winners serve as role models for the entire industry and their long-term success is a testament for how seriously they take their safety responsibility." To learn about how to become a professional driver for Ryder visit www.ryder.jobs or www.drive4ryder.com. Ryder is a FORTUNE 500® commercial transportation, logistics and supply chain management solutions company. Ryder's stock (NYS: R) is a component of the Dow Jones Transportation Average and the Standard & Poor's 500 Index. Inbound Logistics magazine has recognized Ryder as a top third party logistics provider and green supply chain partner. Ryder has also been ranked three years in a row as one of the top 250 U.S. companies in the Newsweek Green Rankings. In addition, Security Magazine has named Ryder one of the top companies for security practices in the transportation, logistics, supply chain, and warehousing sector. Ryder is a proud member of the American Red Cross Annual Disaster Giving Program, supporting national and local disaster preparedness and response efforts. For more information, visit www.ryder.com and follow us on Facebook, YouTube, and Twitter. The article Ryder Names Top Drivers of the Year originally appeared on Fool.com.